Instead of the pumpkin patch, head to the fruit aisle of your local supermarket. Forget about traditional jack-o'-lanterns and faux cobwebs:! Halloween decor is getting a funky twist thanks to three new trends that are blowing up on social media. From Christmas trees that are decked out with all the spooky trimmings to carved pineapples, these aren't your typical Halloween decorations. 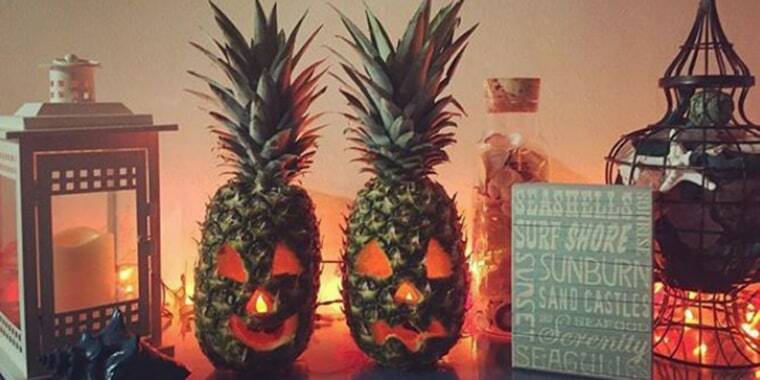 Halloween is officially getting a tropical twist, and we like it! Move over traditional pumpkins because this year it's all about pineapple pumpkins. Instead of using the typical bright orange pumpkin to carve out ghoulish jack-o'-lanterns, people are using good 'ole pineapples to create boo-tiful designs. Sure it's different, but we think it brings a sweet twist to typical decorations. This Halloween season there's a trend making waves everywhere: Halloween-themed Christmas trees! People are now starting to put up and decorate trees around their houses in October rather than starting in late November or December. But these trees aren’t your typical Christmas trees; they're much spookier! Rather than the usual candy canes, tinsel and mini snowman ornaments, these trees are decorated with cobwebs and ornaments shaped like skulls and pumpkins. Some are also replacing the Christmas angel at the top of the tree with skeletons. Spooktacular! Instead of waiting to bring down the tree from the attic after Thanksgiving, now you can just simply swap out the decorations after Halloween is over. Easy peasy! This unusual way to decorate pumpkins is one of the coolest carving trends we've seen yet. Now you and your family can get crafty together and create a diorama inside of the pumpkin. If you're curious, check out this spooky wolf tutorial at Country Living. The dioramas look way harder than they actually are. Start off by carving out the front side of the pumpkin. You can even paint the pumpkin a different color if you want! Then, cut a Styrofoam block and glue it inside the pumpkin for the backdrop. Once you do that, add some spooky decorations to personalize your pumpkin! This pumpkin decoration method is practically mess-free and offers a unique twist to the traditional pumpkin carving. If you need more inspiration, check out this haunting house tutorial at Lia Griffith. This article was originally published on Oct. 26, 2016 on TODAY.com.